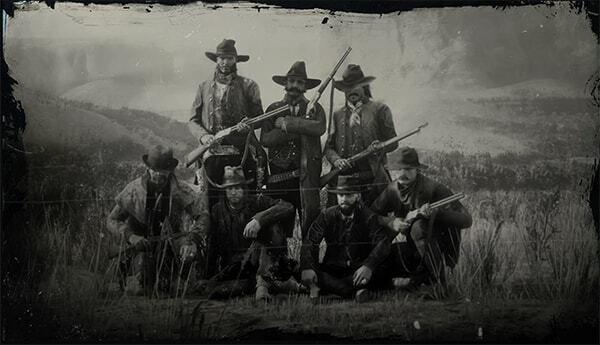 O'driscoll Boys is a Gang/Group in Red Dead Redemption 2. The O'Driscolls have been around since the early days of the Van der Linde gang, and by 1899 the two gangs formed a long-standing rivalry. The O'Driscolls managed to attract many young men into their ranks, and thanks to their large quantity of members, covered a lot of territory to themselves. Colm O'Driscoll prefers quantity over quality when it comes to recruitment, so standards to join the gang are very low, as is the leadership's loyalty to their men, as those killed are easily replaced. The gang is ruthless and has no qualms about murdering innocents, including women and children. The gang is first encountered at the Adler homestead, having taken shelter there after murdering Sadie's husband. After a confrontation with Dutch, Micah and Arthur, most of the members are killed, while the remaining member, upon interrogation, reveals the gang is planning to rob a train belonging to Leviticus Cornwall. Dutch later leads a raid on their main camp, stealing dynamite and blueprints as well as killing a large of number members. While returning to their camp, the Van der Linde gang run into a lone O'Driscoll, whom is subsequently captured by Arthur Morgan. The captured member later leads the Van der Linde gang to a large O'Driscoll hideout where, he claims, Colm O'Driscoll himself resides. While a large number of the O'Driscoll gang is killed, Colm is nowhere to be found. Because he saved Arthur's life, the former O'Driscoll is allowed to join the Van der Linde gang. Meanwhile, Micah gets into a fight with some O'Driscolls at Strawberry, and is subsequently arrested for gunning two of them down. He manages to escape, however, with the help of Arthur Morgan. Later on, the gang ambush Arthur and Micah after the two steal an armored coach. The pair manage to fight them off, however.